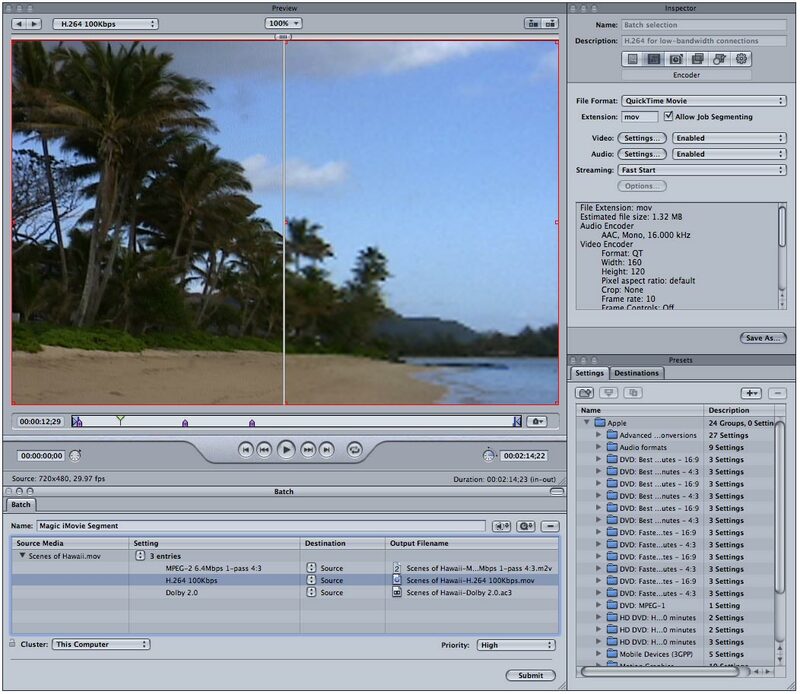 Compressor 2 includes encoding settings that output to a variety of media, from HD-based DVDs to mobile phones. While most people will use Compressor for MPEG-2 compression for DVD Studio Pro projects, Compressor 2 has many attributes that make it as useful as Autodesk’s Cleaner or Sorenson’s Squeeze. We encoded high-definition material to MPEG-4 and H.264 for Web delivery, and the results were beautiful and had surprisingly low data rates. Still, for movies destined for the Web and CD-ROM, Squeeze ( ) is a more versatile choice; it supports more video formats and does a better job at low bit-rate compression. On the audio front, Compressor 2 can encode Dolby AC-3 audio, the most common format for DVDs. Thankfully, Compressor 2 replaces the awkward A.pack utility that accompanied previous versions of DVD Studio Pro. That’s cause for celebration, but Apple missed an opportunity to ease the transition for veteran users: DVD Studio Pro 4’s otherwise excellent documentation doesn’t specifically mention A.pack’s demise. Topping the list of new Compressor features is distributed rendering through Apple’s Qmaster, a program first designed for Apple’s Shake compositing program. Compressing and transcoding videos can be time-consuming, so harnessing more processing power from other Macs on a local network can help you save time. The most efficient scenario for distributed rendering is in an optimized environment that has a cluster of Xserves with video media stored on a shared Xsan volume so nothing needs to be copied from computer to computer. A New Squeeze Compressor 2 sports a new look and many new options. With its Preview window’s split-screen feature, you can get a before-compression and after-compression preview of your video. In the initial release of Compressor 2, an optimized render environment like this was necessary to achieve time-efficient encoding — people without this optimized environment who wanted to create an ad hoc cluster from older Macs lying around the house were out of luck. If the computers in such an ad hoc cluster varied greatly in terms of processor power, it would be possible for a two-computer distributed rendering job to take longer that a single-computer job. But with the 2.0.1 release of Qmaster and Compressor, Apple added support for these non-optimized clusters. Indeed, with the 2.0.1 update, distributed renders, even on nonoptimized clusters, will often give you a time advantage. But if you don’t have shared storage, media will need to be copied to all the computers; therefore, lower data-rate, compressed-video formats such as DV, DV50, HDV and DVCPRO HD will be best suited for distributed rendering in these environments. Compressor’s transcoding capabilities have also been improved with the addition of optical flow image analysis. You can now transcode NTSC video to the European PAL format and get very good, though slow, results. In a month of testing, we never encountered the dreaded “Cannot connect to Background Processes” bug that plagued all previous versions of Compressor. We can hope that this frustrating bug has finally been stomped.